Visit the archive to view artwork and merchandise that was available during the The Chosen Few show. Graffiti artists have been gracing the public environment with their script and calligraphy styles mixed with bold colors and creative designs since the early 70s. These artists used public walls as canvases to express ideas, political statements, anger, fame and love. Due to harsh law enforcement retaliations against the graffiti art form, graffiti artists had to adjust and find new ways to express themselves. Enter the gallery scene. Graffiti may still be illegal out on the streets, but within art galleries it has become a legitimate art form. 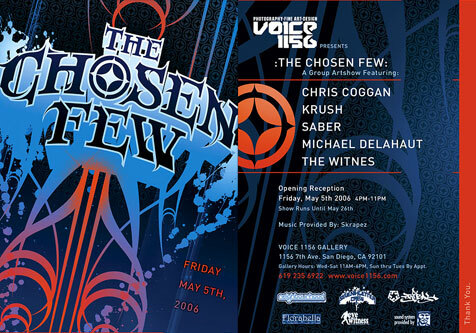 The VOICE 1156 Gallery presents The Chosen Few, an exhibition featuring the artwork of Christopher Coggan (NYSE), Michael Delahaut (WISE), KRUSH, SABER, and THE WITNES. These five Los Angeles based graffiti artists worked together in a variety of crews throughout the years, learning from one another and influencing each other’s styles. Although emerging from similar roots these artists have developed their own individual approach. The artists have also morphed and adapted their graffiti style from the streets into the gallery, each embracing a different medium and technique. This exhibition is titled after the notorious Los Angeles crew, The Chosen Few, or TCF. Artists Michael Delahaut (WISE), KRUSH, and Chris Coggan (NYSE) were all a part TCF at one time. TCF dispersed artists into many of Los Angeles' most well known crews like Angels Will Rise (AWR), Kings Stop at Nothing (KSN) and Can’t be Stopped (CBS). Many of the past members of TCF remain active today; others achieved legendary status before their passing. TCF laid the groundwork and were influential forces for many graffiti artists including SABER and THE WITNES. Currently all five artists work together in either the Seventh Letter Crew, AWR or Mad Society Kings (MSK). Christopher Coggan was first drawn to art after seeing the graffiti that flanked the LA River in 1982. At the young age of 12, Chris started practicing the graffiti style of lettering and painted his first mural in 1984. By 1988, he achieved notoriety when his artwork was featured in the LA Times and People Magazine - marking possibly the first instance of a graffiti artist receiving international press for his crimes. By 1997, Chris had painted well over 300 murals as a member of Los Angeles’ famed AWR graffiti crew. Chris’ creative direction has now moved from graffiti to more conceptually based imagery. His goal as an artist is to build a bridge between street-based and gallery style art, creating pieces with both commanding presence and social conscience. Combining his specialized painting and digital art skills with traditional mediums of delivery, his mixed media work is best described as “Tradigitital™”. Chris earned his B.S. in Biochemistry and Cell Biology from UCSD in 1997 and pursued a career at Scripps Institute of Oceanography. He turned his focus to business and in the spring of 1998, along with two partners, he started an award-winning web development and multimedia design firm. After a forced resignation, Chris founded Coggan Creative in 2005, a design collective that currently pays the bills. His latest endeavor, Neighborhood Holdings Incorporated, is focused on retail clothing and house wares as well as a signature line of designer wears. In addition, Chris currently is earning his Masters of Fine Art at the University of California, San Diego. Michael Delahaut (aka WISE) was born and raised in Los Angeles. Starting in 1984, he became a participant in the early graffiti scene in Los Angeles. An artist of many disciplines and a graduate from the Art Center College of Design in Pasadena, Michael went on to become a Senior Designer at Wieden+Kennedy/New York working on award winning projects for such clients as Nike, Jordan, cKone, ESPN, Fleet Bank, MLB, NHL, and the NFL. Despite his commercial experiences, Michael considers his greatest art/design accomplishment an educational CD-ROM produced with other Art Center students about the life and remarkable accomplishments of Jackie Robinson and his brother Mack. The award winning educational piece was distributed throughout schools in the United States and helped to fund a scholarship at Art Center for future students. Currently residing in Hollywood, Michael works as an independent designer/art director and artist. He sites the work of his peers as his greatest inspiration. For over fifteen years SABER has used the urban landscape as a monumental canvas influencing local graffiti styles all over the world. In 1997 SABER painted the world’s largest graffiti piece on the cement banks of the Los Angeles River. Measuring 250’ x 55’ and using 125 gallons of latex roller paint. This massive expression of raw graffiti power is considered one of the most important pieces in graffiti history. This art was featured in Light/Motion/Dreams, an exhibition on the history of the LA River at the LA County Museum of Natural History. Prolific and diverse, SABER’s work extends beyond his street art by catching the attention of the fine art world with his hyper real oil paintings of cityscapes. SABER is also noted for his ability to translate his graffiti into three-dimensional sculptures collected by art aficionados and those that are part of the urban culture scene. His influence and impact on the urban culture has reached the world of corporate branding in which he has developed a relationship with Toyota / Scion who has championed leading underground artists in their ground breaking promotion Installation – Scion Art Tour 2004-05. His breaking wild style art found on full size Scion cars has influenced the Saber Exclusive Custom Shop line for Maisto International. SABER perfected his wild style graffiti pushing it to the limits. His art has contributed to the advancement of contemporary street art as a legitimate art form extending its reach far beyond its original graffiti roots. Born September 27, 1971 in Los Angeles, KRUSH's initial exposure to Graffiti Art came from seeing the movies ‘Beat Street’, ‘Wild Style’ and discovering the book Subway Art. Immediately drawn to the colorful, vibrant media of spray paint and the various forms of lettering that were developed in New York City, he dedicated himself to the development of lettering called the “Wildstyle”. Inspired by artist's such as Seen, Futura, Lee, Dondi, Phase 2, Dez, Doze, Skeme, kase 2 and many others, he practiced for hours trying to emulate what he saw while developing his own original style, as he knew he would never achieve any respect duplicating somebody else's artwork. In 1986/1987, he embarked on his first trip to the now legendary Pan Pacific, PicoYard and Jefferson Yard which exposed him to LA Graffiti artists such as Riot, Flame, Risk, Dream (SMD), Rise, Soon, Charlie, Rev, Grems, and many others. This first generation of Los Angeles Graffiti artists were a huge influence and set the stage for many others to follow. Around this time, KRUSH met fellow writers Rage and Wise, and in 1988 all three were invited to join the prominent LA crew "Kings Stop at Nothing" (KSN). Krush later joined the infamous "Angels will Rise" Crew (AWR). "Everybody learned from each other's strengths and the whole crew was rocking some of the best pieces at the time" explains KRUSH. AWR still has some of the best writers on the street and along with it's brother crew MSK, they continue to move graffiti into the future. Currently, KRUSH paints walls with the infamous Seventh Letter Crew, creates fine art, composes music, and is a graphic designer with Los Angeles firm 71Designteam. The Witnes, also know as Tyke AWR, made his first imprints in California, where he practiced and apprenticed under some of Los Angeles's most influential graffiti art masters. Over the last decade, he frequently painted murals and graffiti throughout several different cities and infamous graffiti yards. He has also participated in group exhibitions in Los Angeles, Toronto, Japan, New York, and Milan. As a participating member of Los Angeles's graffiti art crews AWR and NASA, The Witnes spent many years collaborating with other writers, working on large spray paint murals, known as productions. In contrast to this latter approach, in his current work, he has shifted away from aerosol spray paint on wall and towards studio work, including painting, character and toy design, and graphic art. In his paintings and drawings, The Witnes incorporates the use of monster iconography, mixed with his own style of organic graffiti creature letters, and cartoon/comic style characters. Aesthetically, his work pays homage to a variety of inspirations ranging from toys, movie monsters, mythical creatures, and sci-fi phenomenon; to graffiti art, skateboard art, comics and cartoons. In 1999 after graduating with a bachelor’s degree in Social Ecology, The Witnes started the EyeWitness Company. EyeWitness produces art-based novelties and apparel related to subjects such as the Sasquatch, BigFoot, Yeti, Lochness Monster and Stonehenge. The EyeWitness concept is based around The Witnes's interests in monsters and crypto zoology (the study of hidden and rare animals and creatures), which has intrigued him for several years. In 2003, The Witnes designed his first series of collectible toys produced by EyeWitness brand entitled Monster Unknown. The first two figures of this limited edition series of vinyl figures are The Bionic Sasquatch and Mr.Oneman. The Witnes is currently working on a comic/cartoon in which both characters will be featured.